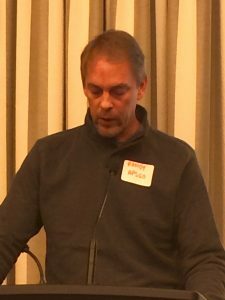 Randy Betts, Head Parenting Coach, and a volunteer for the Guelph chapter of APSGO says a heartfelt “Thank you!” to 100WWCG for their October donation. My name is Randy Betts, and I am a volunteer parenting coach for the Guelph Chapter of APSGO, the Association of Parent Support Groups in Ontario. On behalf of our entire organization, I would like to express our extreme gratitude for the generous donation provided by the hundred plus women who care of Guelph. It may come as a surprise to some of you that it was the care and concern of 2 women who started our charity more than 30 years ago. They cared about the poor life choices that their teenagers were making. They also cared about the impact that their childrens’ behaviour was having on their relationship with their child and their family and ultimately they were concerned that other families might be going through the same struggles. I owe a debt of gratitude to these women and the many other dedicated parent volunteers that I credit with saving my family. These APSGO parents shared their stories of struggle, gave me hope and ultimately helped me to establish peace in my home and rebuild a broken relationship with my troubled teen. APSGO continues to provide invaluable support to the parents and guardians of acting out youth in Guelph and various other Ontario communities. Even though APSGO has provided life-changing coaching services to hundreds of families in Guelph/Wellington and the surrounding areas, we are still a relatively unknown entity. As our co-founder, Helen Jones, who is still very active in our organization, has been known to say; “APSGO is the best parent support group that no-one knows about”. As APSGO parents know, there is a profound need for the services that we provide based on our connections with schools and numerous youth agencies and community groups in Guelph and Wellington. The youth in our community are struggling with life and face adversities such as drug and alcohol abuse, on-line bullying, depression, anxiety, self-injury, eating disorders and a range of other experiences that impact their quality of life and leave parents tearing their hair out. Our coaches are dedicated, have first-hand experience and specific training to help parents in dealing with acting-out-youth. Many of our parent graduates, myself included, will attest to the positive effects that this program has not only had on the way that we deal with our children, but also in the interactions that we have with friends, family, coworkers and even complete strangers. The APSGO principles of building positive relationships are important in all areas of life. Your donations are immensely important in helping us to reach out to our local community. APSGO Guelph will be using the funds from the 100 Women who care to fund a conference for parents of teenagers and young adults in our community. This event will provide valuable information for families and others supporting youth in our area, whether they are exhibiting high risk behaviours or not. The conference will provide valuable information and tools for parents of teens and older millennials while providing greatly needed exposure and networking opportunities for APSGO and other experts and organizations with-in our community. This entry was posted in Chosen Charities say Thanks on January 11, 2017 by Miriam Vince.